To pick one thing I love the most about summer would be impossible. Summer is my all time favourite time of the year. Yes, even more than Christmas, although it is a close close second. I become a creature of the outdoors, I get to wear sundresses and flip-flops, and I get to spend weekends at cottages and at backyard BBQ parties. There is nothing (that I can think of) that I dislike about summer. Not even 50 degree heat waves can make me say otherwise. I stopped off at the fruit market around the corner from my apartment the other day and was reminded of another thing I love about summer: the fruits and vegetables - especially the fruits. Peaches are ripe, cherries spill out of their bags, and yellow zucchini is front and centre on the shelves. 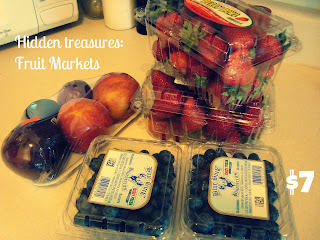 I love independent fruit markets and buy my fruits and vegetables from them almost all of the time. The prices are so much more reasonable. The market near me (and another one just a short walk away) sell their fruits and veggies at prices so low it seems impossible to walk away without a bag full of food. The other day I picked up 2 containers of strawberries, 2 containers of blueberries, and a package of 2 peachs and 2 plums all for a grand total of $7.00. Blueberries usually retail for around $3.99 a container and I got 2 for $3! 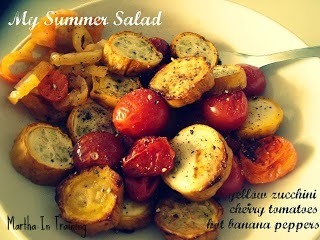 I took my love of all things cheap and summer-y and made myself a delicious summer salad. It's the easiest thing you will ever make and it tastes so good. All you need to do is roast 1 yellow zucchini and some heirloom cherry tomatoes in the oven , season them with pepper, and add some hot banana peppers (which I have become obsessed with lately). Hope you are finding some inexpensive places to buy fruits and vegetables and being inspired to make some delicious summer meals.